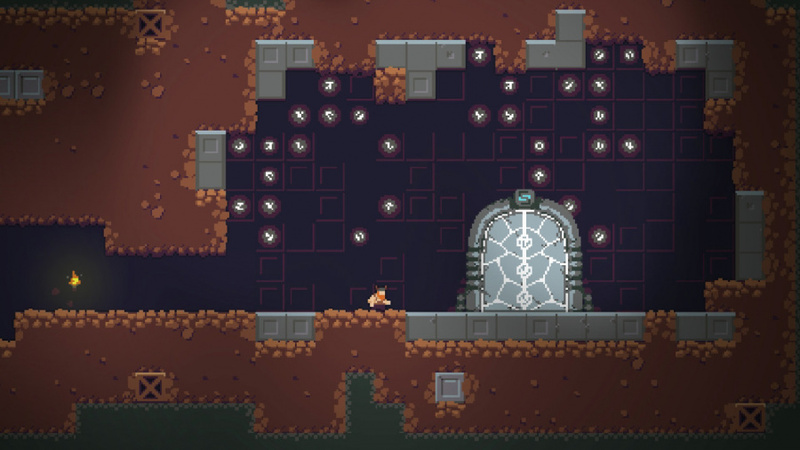 At this point in time, the “roguelike” indie game has become a trite and overused thing; there are more roguelikes out there now than any human could possibly have the time to play, and a lot of them don’t really do much to try separating themselves from the pack. Enter Caveblazers, a Spelunky-esque new roguelike that, much like other games in the genre, aims to combine randomised level layouts, soft RPG mechanics and absolutely crushing difficulty into one endlessly replayable package. It’s not exactly a hard formula to get down, but Caveblazers manages to stick the landing quite well in how it implements these things, even if it feels uninspired. 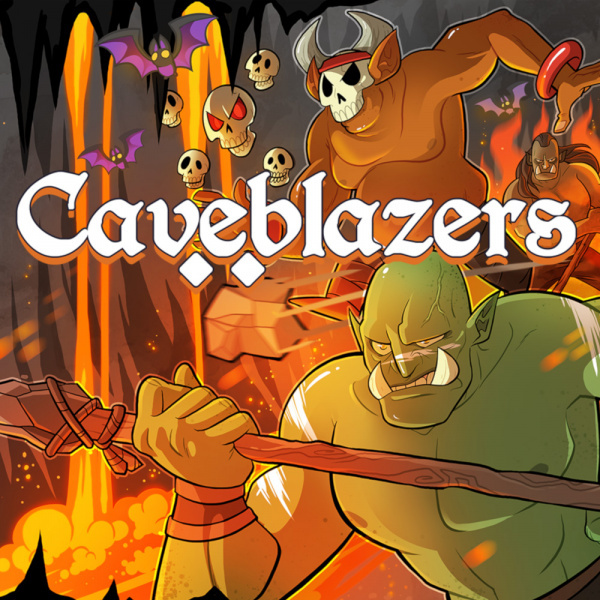 Caveblazers doesn’t really feature much in the way of story; the narrative can be mostly summed up in there being a cave which holds unimaginable power and you play the role of an intrepid adventurer who’s come to plumb its depths. Unlike, say, Dead Cells, there isn’t much effort made here to even weave in a background narrative, but it’s difficult to fault such a gameplay-focused title for this omission; it’s fun to play, and that’s ultimately what matters here. Even so, this lack of storytelling prowess contributes to Caveblazers’ biggest issue: its lack of memorable identity. Though fun to play, running through a homogenous blend of generic caves and a ho-hum tide of minions comprised of bats, orcs, skulls and other fantasy monsters doesn’t leave much of an impression after you put this one down. A typical run of Caveblazers will likely take you anywhere from five to ten minutes, and when your character finally bites the dust, its back to square one to start all over. Still, some progress is carried over between runs to give you a gradual sense of ascending power, and this is largely handled through a level up system which doles out EXP upon death based on your performance, taking into account factors like how many enemies you killed and how many floors you cleared. Each time you level up, your character gains access to something new, whether it be a fancy hat for them to wear or, more helpfully, a new item for the loot pool or a new perk to skew your character’s starting stats. What’s nice about this system is how it creates a constantly rewarding feedback loop, regardless of how skilled a player you happen to be. Naturally, those who can make it farther will accrue more EXP and unlock things faster, but short runs still see you earning new unlocks at a relatively brisk pace. This makes for a rather exciting experience, as there’s always something you have yet to unlock that’s just around the corner, and the drip of new stuff ensures that you more or less demonstrate mastery over existing gear before moving on. Your character starts off each run with a simple sword and bow, but these can soon be replaced with better weapons, along with a slew of rings, pendants and other magical accessories that can be equipped alongside your weapons to augment your stats and offensive strategy. 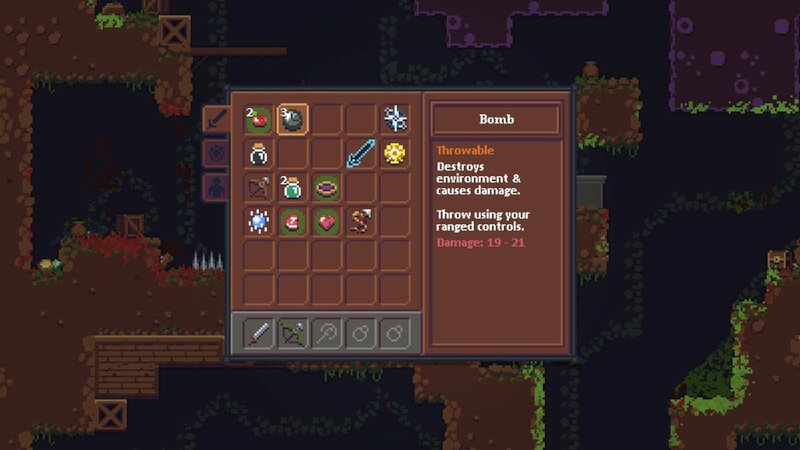 It’s important that you put some critical thought into the kinds of things you equip, however, as Caveblazers is all about the principle of ‘give and take’. For example, you may find a ring that boosts your ranged damage and fire rate, but also lowers your overall damage resistance. Another example can be found in the coloured potions that enemies often drop. It’s a complete mystery what any given potion will do; drinking one may grant your character temporary invincibility and bump up their melee attack stat, or it may lower their max health and set them on fire. This unpredictability is what keeps things interesting from run to run, as it can lead to some ridiculously overpowered or underpowered builds, egged on by the constant, merciless pressure of the monsters that live in the caves. It must be said, however, that Caveblazers falls a little short in terms of its combat, which makes up the meat of the experience. Though there are exceptions, much of the weaponry on offer feels too similar in playstyle, and combat ultimately devolves to a quick dance of hack ‘n’ slash action with some evasive jumping thrown in. In short bursts or in co-op, this works out just fine, but longer play sessions (or the occasional boss fight) reveal the inherent simplicity of the mechanics, which can make it easy to get bored. Those of you that can get past the okay combat will find plenty to love, as Caveblazers is the sort of experience that’s utterly packed with secrets and collectables. 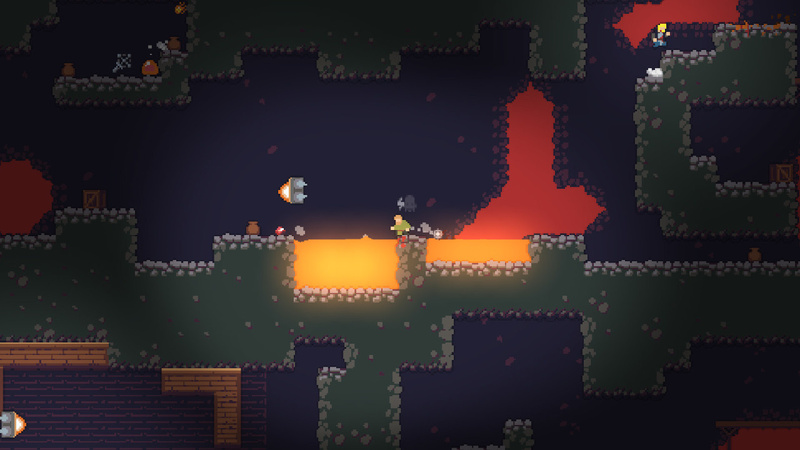 Though the meat of your experience will be found in the main mode, there’s also a daily run – which gives you one shot at getting as far as possible with a given loadout – and an arena-style mode with its own progression system that challenges you to make it through as many waves of enemies as possible. Encircling all this is a ‘Challenges’ tab in the pause menu that acts as an in-game achievement system; hitting certain milestones and completing certain feats unlocks new perks and weapons to help you in your journey. 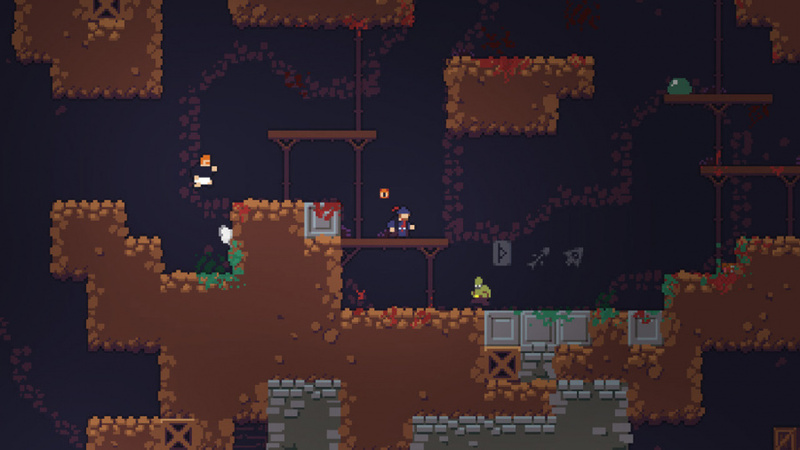 Taking into account all this with the added bonus of local split-screen co-op, and it’s not hard to see how one could feasibly spend dozens of hours on all this content; it may not be memorable, but never let it be said that Caveblazers is an anaemic roguelike. Caveblazers opts for a visual style that apes the look of games such as Celeste and Risk of Rain; it’s clearly in HD, but there’s certain retro flair to the look that keeps things grounded and arcadey. The issue that we have, however, is the lack of imagination or detail applied to the environments and character sprites. Though later areas are a little more interesting, Caveblazers is too comfortable sticking to dull environments packed with browns, greys and greens, rarely approaching anything we’d call eye-catching. Granted, it makes sense given that everything takes place inside a cave, but this art direction isn’t visually interesting, and the simplistic character sprites don’t do much to breathe life into boring environments. The same criticism extends to the soundtrack, too, which is a rather laid back, acoustic guitar-focused collection of medieval-themed tunes that match the action well, but aren’t very catchy or notable in their own right. 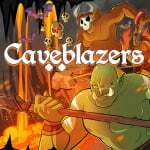 Caveblazers doesn’t do enough wrong to be disappointing, but it doesn’t do enough right to be exceptional, meaning that it occupies that awkward space in the middle. The utterly unremarkable visual style and simplistic combat is offset by a surprisingly deep well of unlockables and well-paced progression systems; this is a roguelike that checks all the right boxes, but never becomes more than the sum of its parts. If you enjoyed Risk of Rain or Dead Cells, Caveblazers is a decent recommendation, but also understand that there are far more memorable titles to be found on the eShop. I found it to be a pretty good alternative to Spelunky, its got a rather ominous uphill battle to get a look in given the vast number of roguelites out there but its quite charming and good fun to play. Better than the graphics suggest it is. The time that good indies were released on switch is over. "there are more roguelikes out there now than any human could possibly have the time to play,"
There's a dozen at best. Twice as many (being generous here) roguelites, and heaps more that claim to be roguelikes but actually aren't. Is already a shame that some developers don't know the difference between a roguelike and a roguelite, and even more shame when an informative site don't know also. Sometimes NL overanalyze a game when in the end, it is simple, is the game fun? One thing is an honest analyze, another thing is trying to find negatives in the game. I was on the fence about this. I might hold off. Although a roguelite with gradual progression between runs, even if you’re not an expert at the game is just my cup of tea. I couldn't disagree more. I've barely been able to put this down, although I totally concede that your mileage may vary. For me it scratches that Spelunky itch plus the health system means that deaths are a little less instant. it's even possible to survive falling on spikes if you have enough health. I miss being able to pick up random stuff (mice, rocks, etc) but the inventory is nice to have and the intelligence of the enemies in tracking you down keeps things tense. My only real criticism is that bosses are only scaled in difficulty by giving them larger health bars, which can feel a bit grindy. Strange. Everything about it looks very solid in the gameplay videos, from the simple but polished retro-ish graphics to the general gameplay stuff (at least based on watching other people play it). Crikey, I couldn't pick this out of a line-up of similar games. This game is Broforce + Dead cells. The glowing reviews pretty much everywhere else are right, this game is super fun. I've seen many solid reviews for the game on PC (88% overall on Steam). I think it's a pretty fun game (again, on PC) and to me it looks like a perfect fit for my ever-growing Switch rogue-lite game library. I've played about 5 hours and I'm really enjoying it. I don't think you'd play it for hours on end, but it's great for a few quick runs before bed. The enemies are aggressive (and have AI - they'll chase you) which really adds to the tension. I got it for under €10 in the South African eShop and it was worth every penny. I also disagree with the review about the music - it's fantastic. I'd give this 8/10 at least. @Retupmocnin Couldn't agree more! I'm actually having to force myself to stop playing this right now cause of everything else I need to get through, its stupid fun and the sheer amount of random stuff you get makes every single run really exciting. I was actually on the fence a couple weeks ago but once I read reviews I knew I needed to get on board. I personally am just tired of indie games going for the retro look. I actually do like sprites and pixel art a lot. But I feel like there's another retro-wannabe like every few days at this point. Also don't help that I don't like Roguelikes/lites. This is actually really fun if you play co-op, not sure if people take into consideration price either, I got it for like 12$ lol. This game is a lot of fun if you're into these types of games. I picked it up on PC awhile back and really enjoyed it but only played for about 5 hours because I ended up playing Vagante a lot more (which is similar but deeper and has multiplayer). I had been meaning to get back to it though. I bought it on the Switch last night and I'm really glad I did. It's perfect for quick sessions and it's hard to put down. Highly recommended. @RickD Yeah these games all seem to blend together after a while. @jobvd I wouldn't say the time for decent indies is necessarily over, but I think we have gotten to the point where the majority of the good indie games that were released on Steam for PC's have been ported over to the Switch. @Retr0gamedad See, that's kind of where I'm at with this. I liked this game, but the whole time I was reviewing it, I was thinking of other, better roguelikes I'd rather be playing. 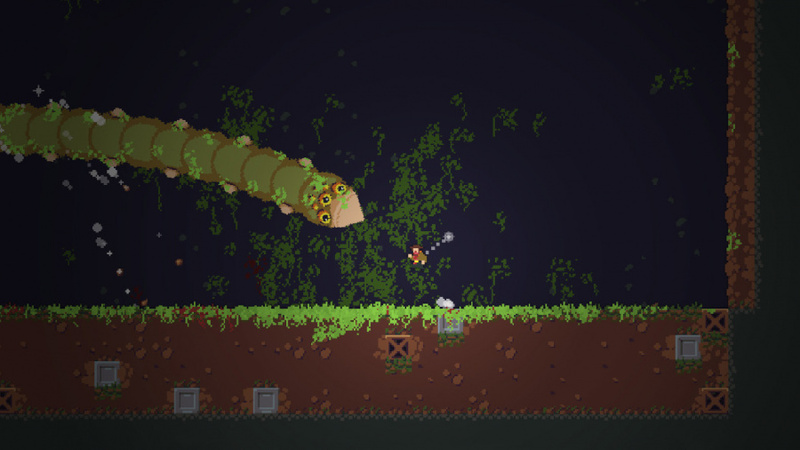 It's a solid roguelike that you can get plenty of enjoyment out of, but it doesn't excel. @Heavyarms55 I believe one of the strongest motivations for developers to go with that route is because of how easy it is to work with them compared to other art styles. Both for the artist and the developer. Personally speaking, whenever I practice game development either on unity or UE4 the sprite tools for frame animations, hitboxes, and the overall process is far easier to make, and I can always ask my artist friends to quickly doodle some sprites to work with since they don't take much time. That being said however, some games such as octopath traveler, owlboy, and the list goes on, show the potential of the art style to really shine with modern tools and incredibly created people. But when it comes to indie games with such small teams and how popular it has become, it really is the safest bet to go with. @JamesJose7 Octopath is a shining example of modern spritework done right. Other examples I can cite for good spritework are Iconoclasts and Shantae and the Pirate's Curse. However many indie games I see just look like the 8-bit 16-bit art style is an excuse to be lazy or to cash in on a fad. And in some cases they make games that look worse than actual retro titles and that is something I find inexcusable on a modern platform. @Heavyarms55 Yeah that's my point, it's easier. Agreed. "Utterly unremarkable"?! These graphics are flat-out ugly! There is such a thing as too retro, people! Throw in one of the worst genres known to mankind and a stupidly brutal difficulty level, and this is a definite pass for me.